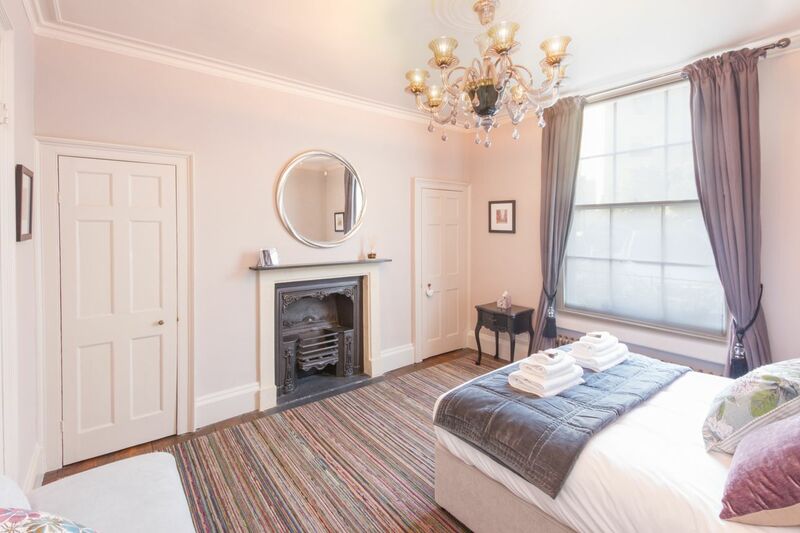 Built circa 1790, all three floors are graced with high ceilings, long elegant sash windows, pretty ornate fireplaces and fabulous chandeliers. 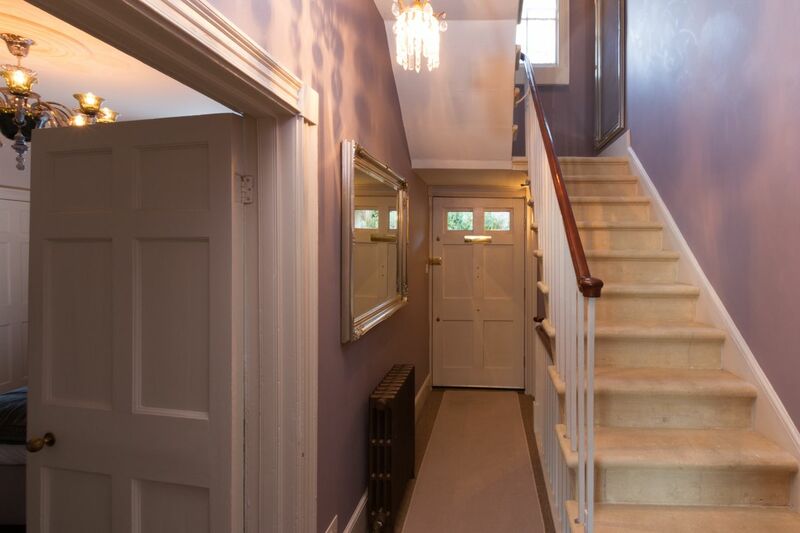 The original feature staircase is in Bath stone, with a curving mahogany handrail. 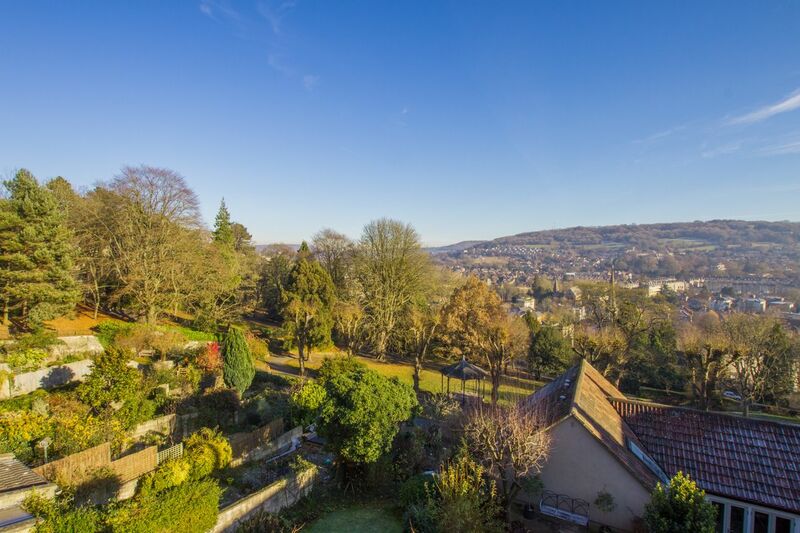 From the back of the house are extensive views of mature trees in a city park, distant rows of grand bath stone terraces, church steeples and hills to the south- east. 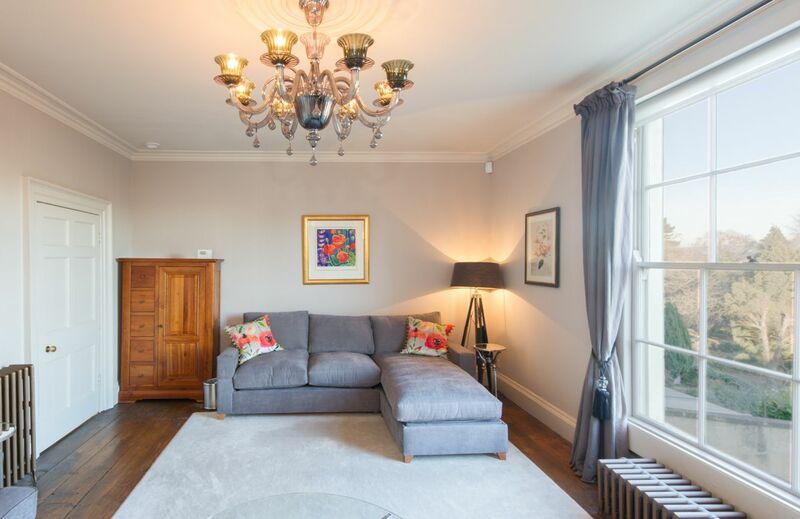 The large Living room has a sensational floor to ceiling window with extensive views and a gorgeous grey glass chandelier. 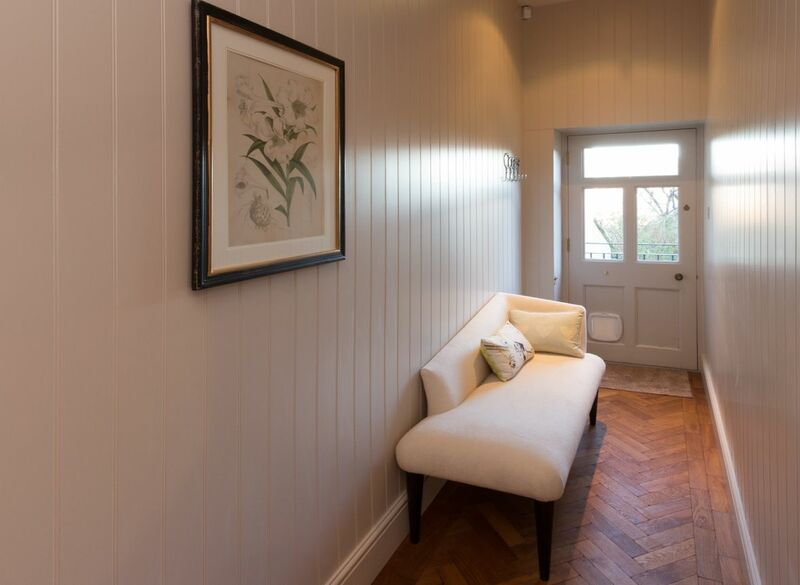 There is a smart grey sofa to seat 2, a sofa with chaise to seat 3 and an occasional chair. A large wall-mounted TV has a Sonos sound system with a Sky Plus HD package. There is Wi-Fi and a digital radio. In the storage units is a DVD player, a selection of films, books and games. 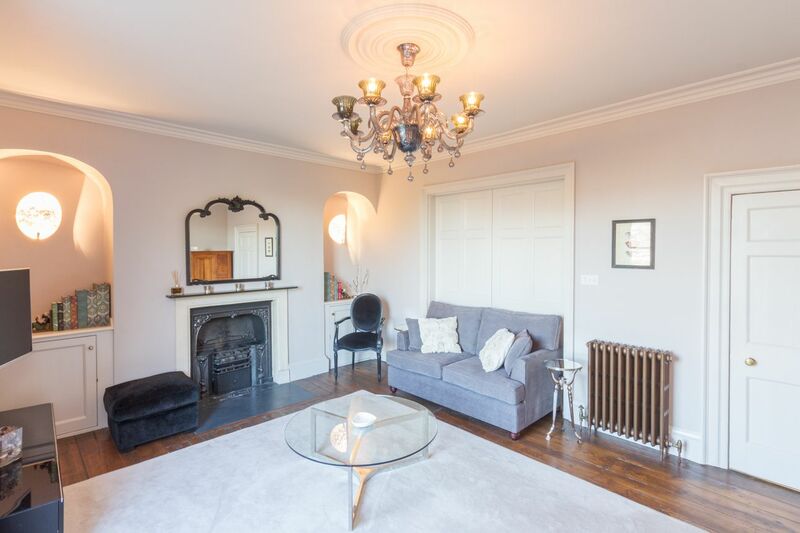 An elegant fireplace has a gas coal-effect fire with a pretty mirror over and fitted alcove cupboards on either side. 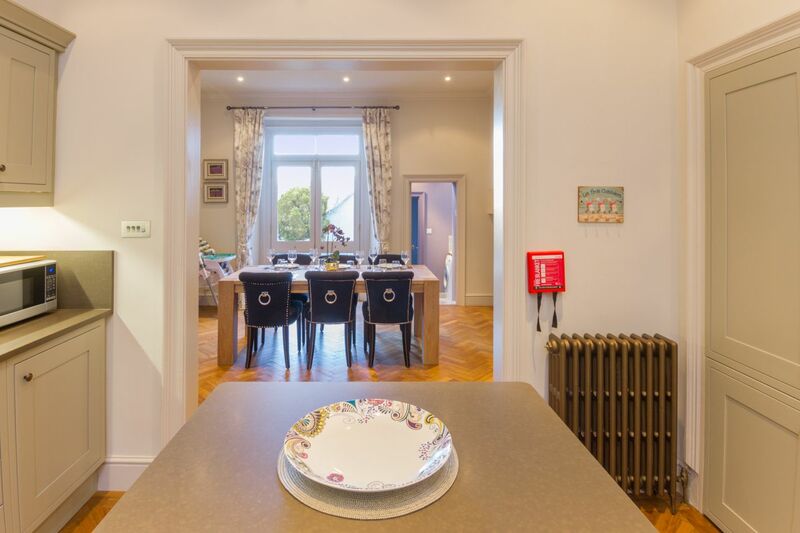 On the lower ground floor is a large inviting open plan kitchen-diner where you could spend the whole evening. 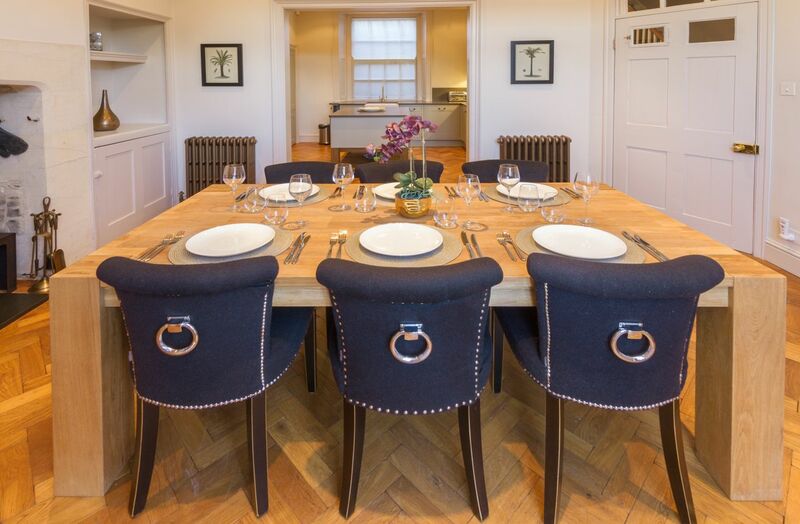 A sturdy oak dining table has 6 comfortable upholstered chairs, with further chairs in the under-stairs cupboard if required. 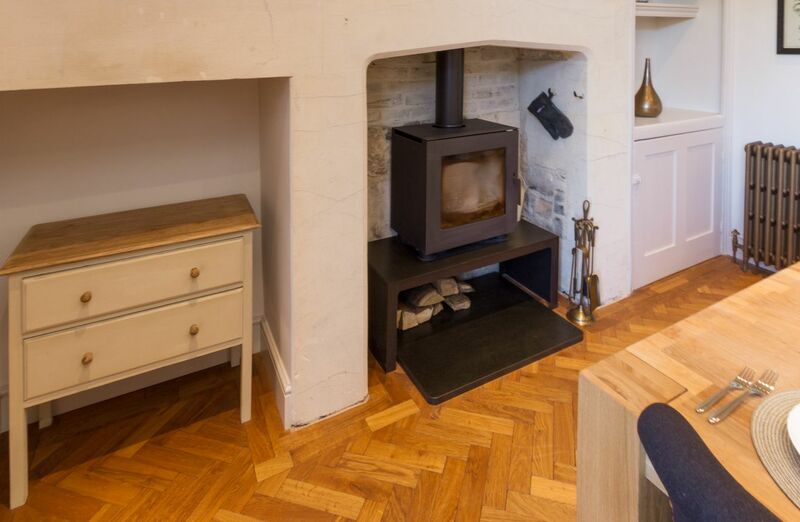 There is a wall-mounted TV, a wood-burning stove supplied with a bag of logs, and deep stone alcoves with storage which would have originally held a cooking range and ovens. 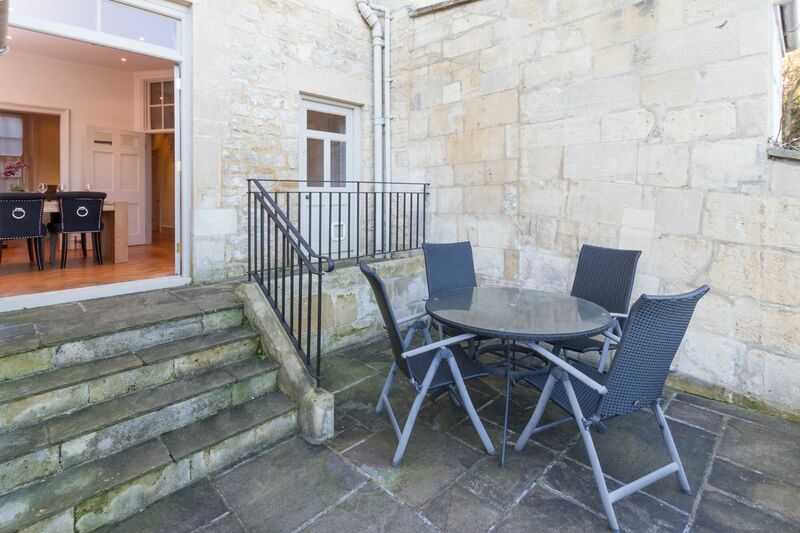 Big French doors lead onto a small stone terrace with an outdoor table and chairs for 4 and a small contained and secure garden. A high chair is also provided along with crockery for young children. 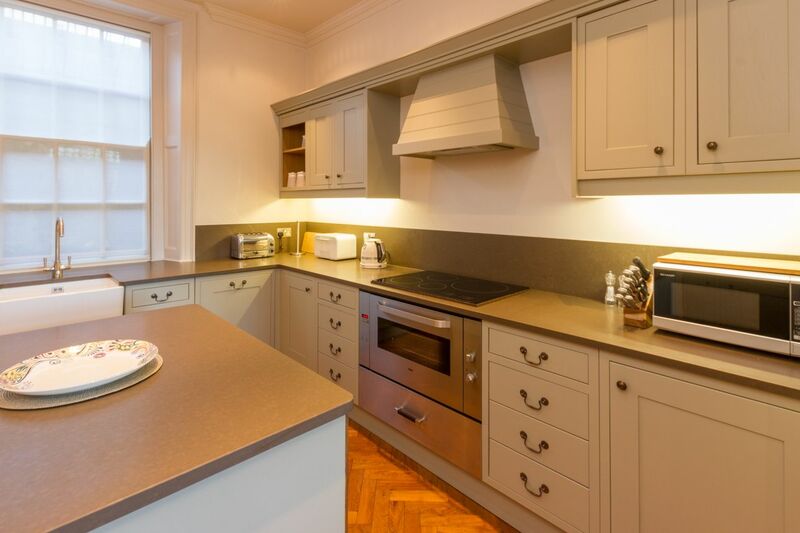 The stylish sage green kitchen has been made to measure with fitted units on 3 sides and a central island. 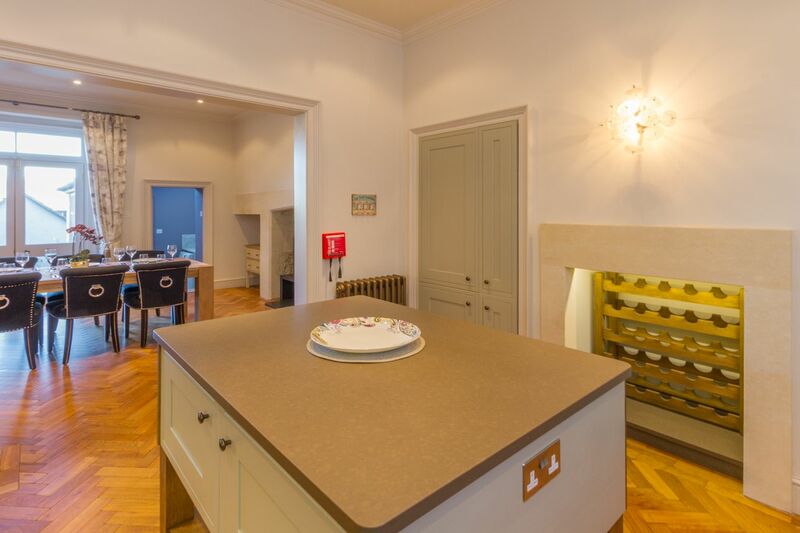 The original fireplace is now home to a generous wine rack with food storage on either side. There is a large 4 ring induction hob and wide electric oven, a microwave, a large fridge and separate freezer and a dish-washer. There is an excellent supply of cooking utensils, crockery and cutlery. A smart granite tiled utility room is a couple of steps down from the dining area. It houses a washing machine, separate dryer and large counter- top sink, with storage under, along with other utility essentials. 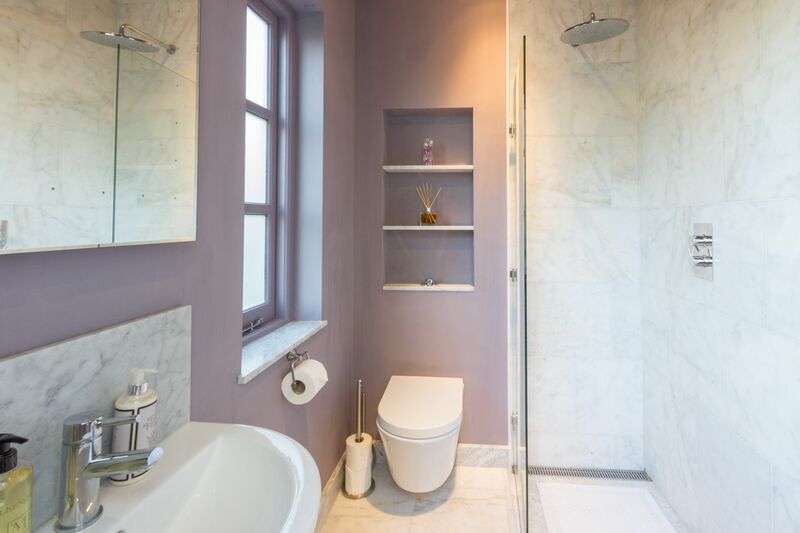 This room leads to a similarly smart contemporary shower room with a small walk-in shower, hand-basin and WC with shelves over. 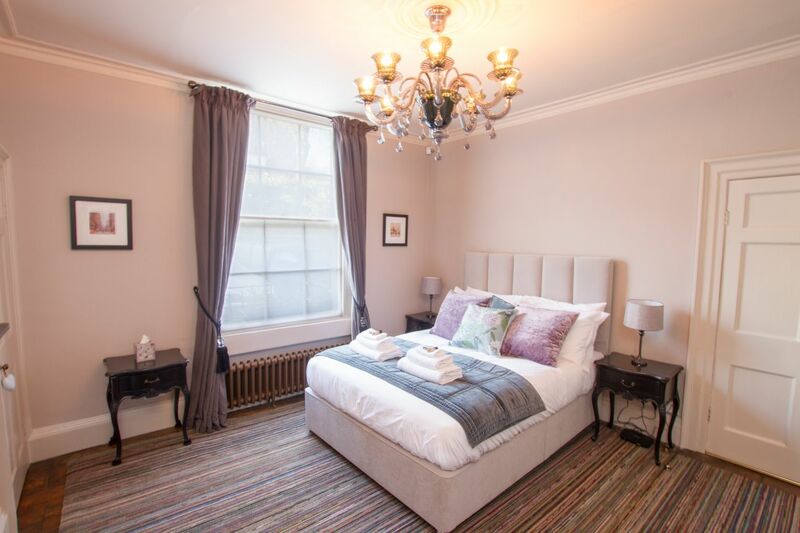 There are 3 spacious and comfortable double bedrooms and each one is provided with a hairdryer. 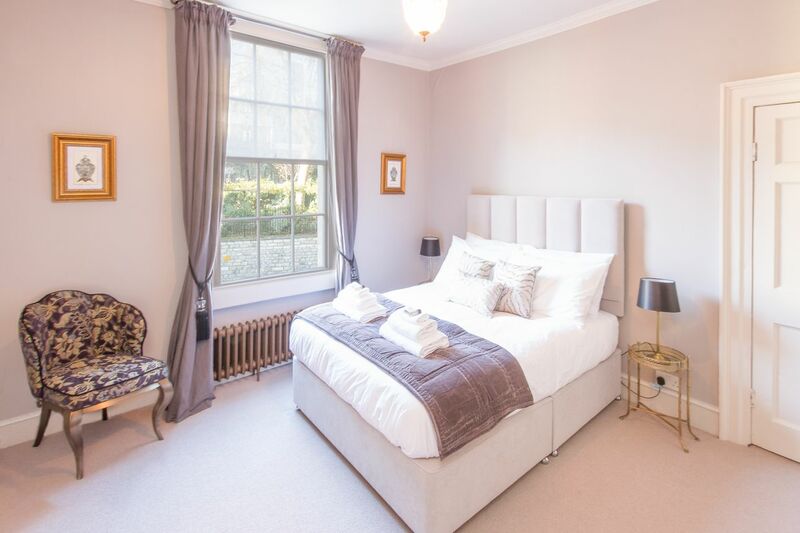 Starting on the ground floor beside the living room, there is a grey and amethyst room with a plush 5’ double bed and chest of drawers and pretty chair. Either side of a charming decorative fireplace are alcove cupboards with plenty of shelving, hanging space and a pretty mirror. 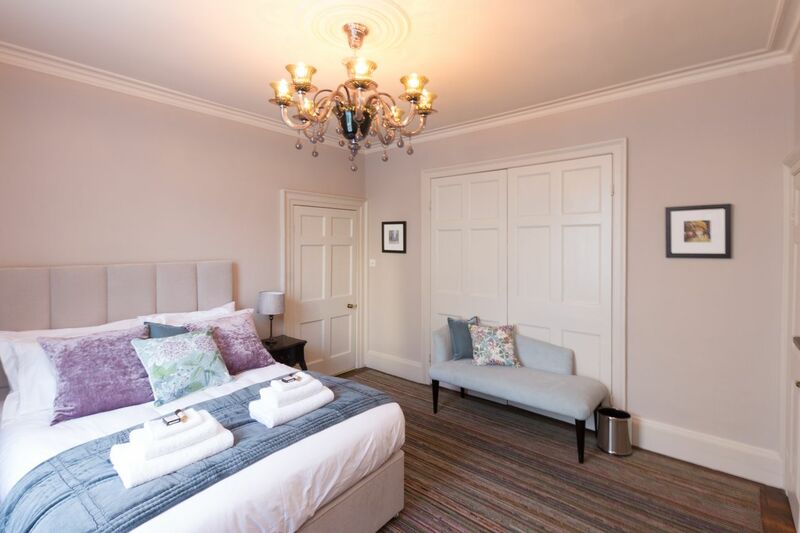 The next double bedroom on the 1st floor is in luxurious mink, with a 5’ double bed and light oak chest of drawers. 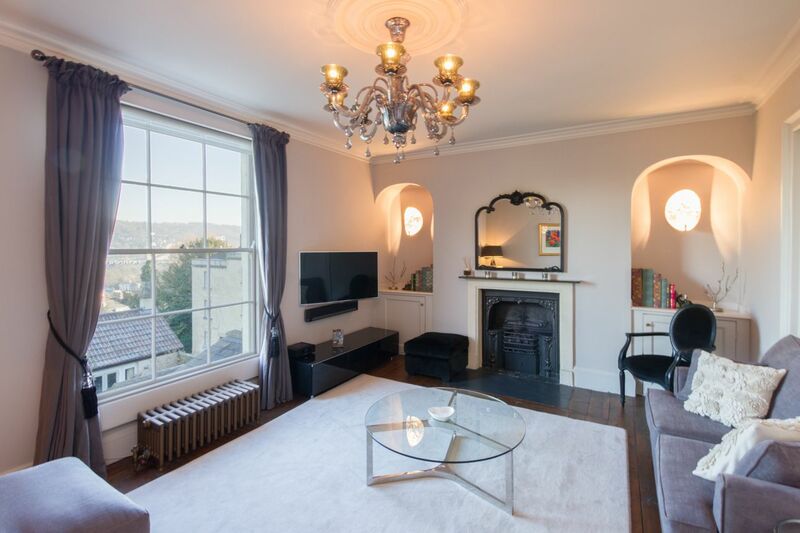 This too has a delightful decorative fireplace with a wall mounted TV over. Alcove cupboards on either side provide plenty of shelves and hanging space. 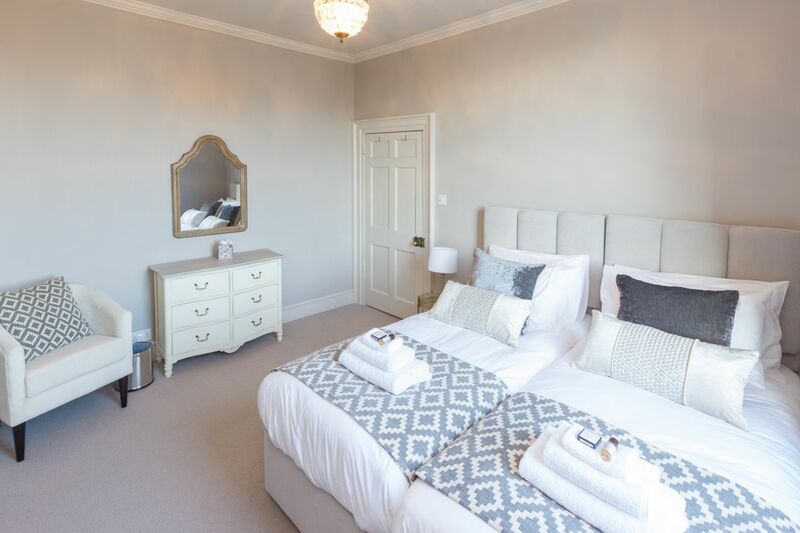 The final twin room in pearl and grey has two 3’ beds that can zip and link to become a 6’ double. 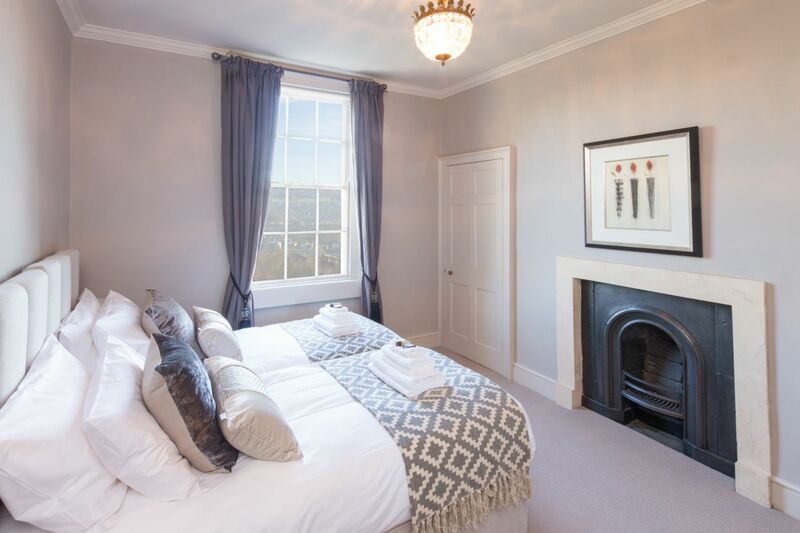 A tall sash window has glorious views. 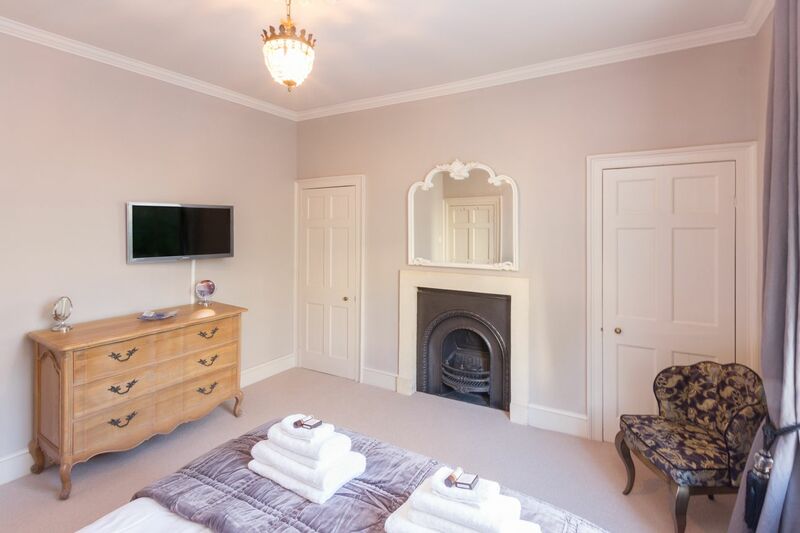 Another delightful decorative fireplace also has alcove cupboards on either side with shelves and hanging space, along with chest of drawers and easy chair. 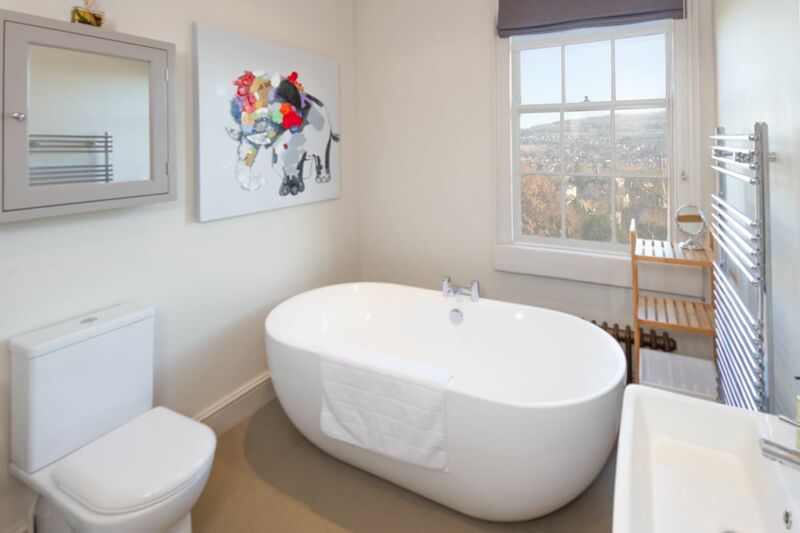 At this level is a spacious contemporary family bathroom which features a generous double-ended bath. 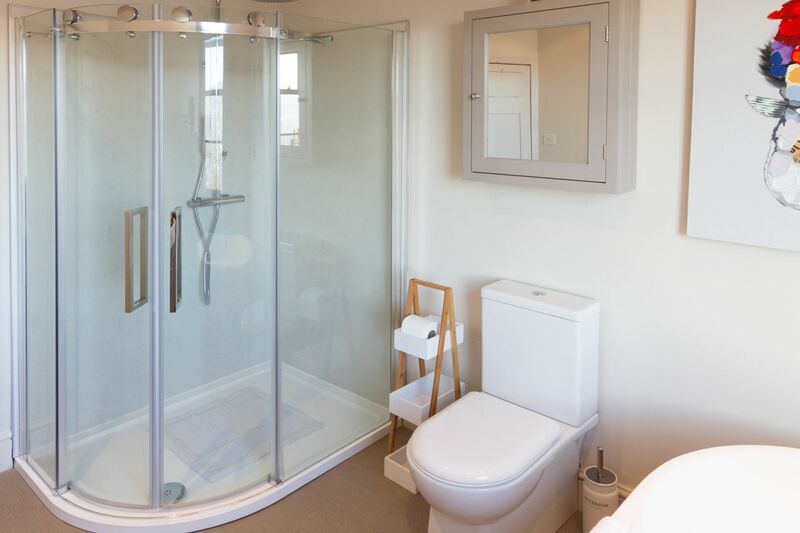 There is a large corner shower, a hand-basin with storage under and a WC with storage over, along with extra shelf space for toiletries. 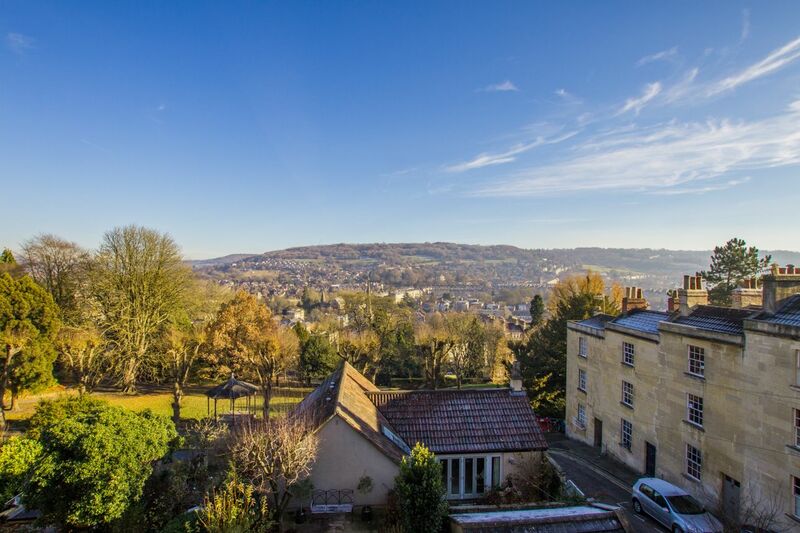 This property is on the northern slopes of Bath and a 5 minute walk downhill to George Street which is lined with restaurants, galleries, night clubs, shops and wine bars. 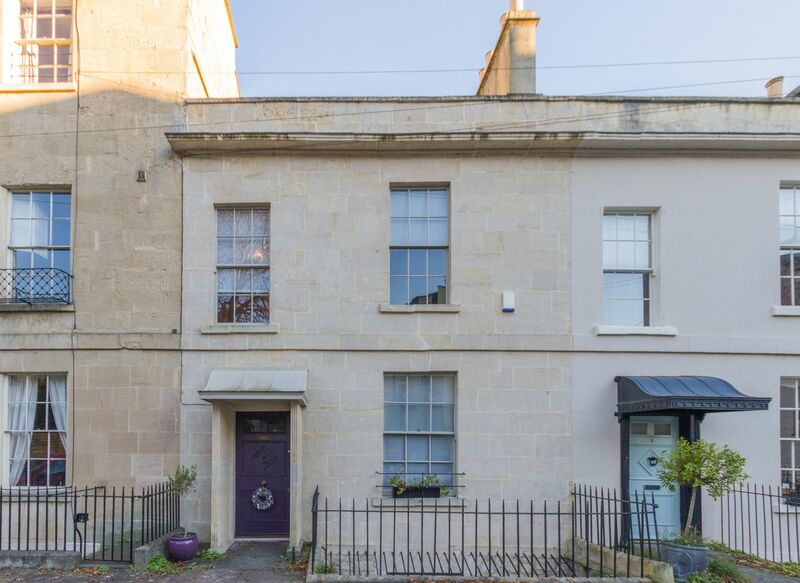 Also off George Street is Milsom Street, Bath's main shopping thoroughfare, which leads down towards the Pump Rooms, the Roman Baths, Thermae Spa and Bath Abbey. 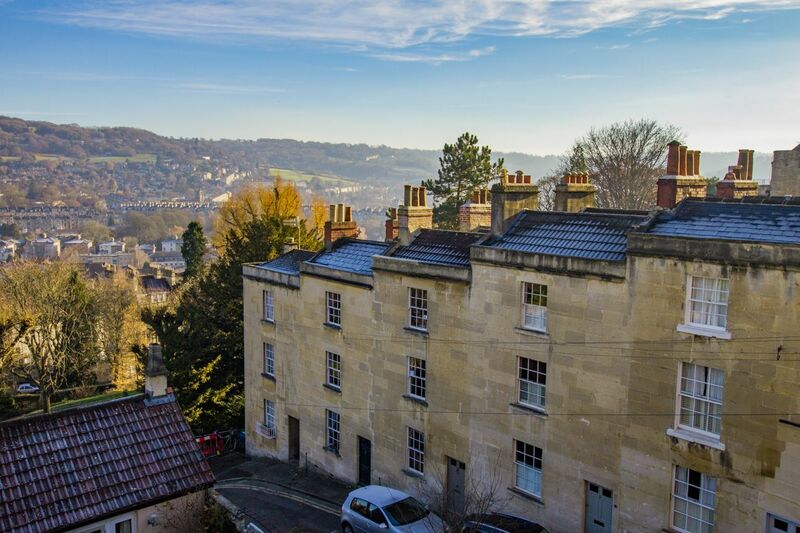 You are also a 5-10 minute stroll to Bath's famous architectural treasures of The Circus and Royal Crescent, set in front of lovely Royal Victoria Park where you can enjoy miniature golf, tennis, botanical gardens, hot air balloon trips and a children's outdoor play area. You have a convenience store and take away shops only a few minutes walk away on Julian Road. Whatever you choose to do, shopping, sightseeing or entertainment, most pursuits are a pleasant stroll of about 5-10 minutes away from your house. We had a wonderful time in the property and would recommend it to anyone, and would definitely stay there again, should the need arise. Magical! Lovely period property.  Great location and views. Thoughtful welcoming touches! Loved the Christmas tree! Highly recommend! 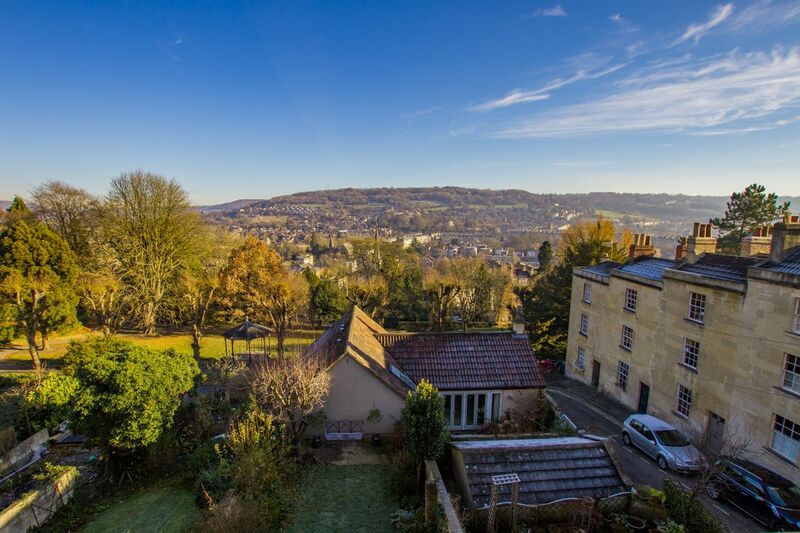 Beautiful and clean, stunning views of Bath, just perfect and such a lovely welcome from Laine. Thank you so much for your hospitality ! Thank you so much for everything my mum had the best birthday and she said it was ‘the nicest place she had ever stayed at’! “Well located large house with an excellent kitchen/family room setup that allows for a nice group stay. Large beds and linens/pillows made our stay comfortable. Thank you for connecting us to cavendish cooks"
5 Star Very good location and standard Recommended for families! 5 star. Very clean and well equipped. Our stay was excellent, great location to walk into town only 10 mins and has outdoor garden too. Property has only one parking space with permit. 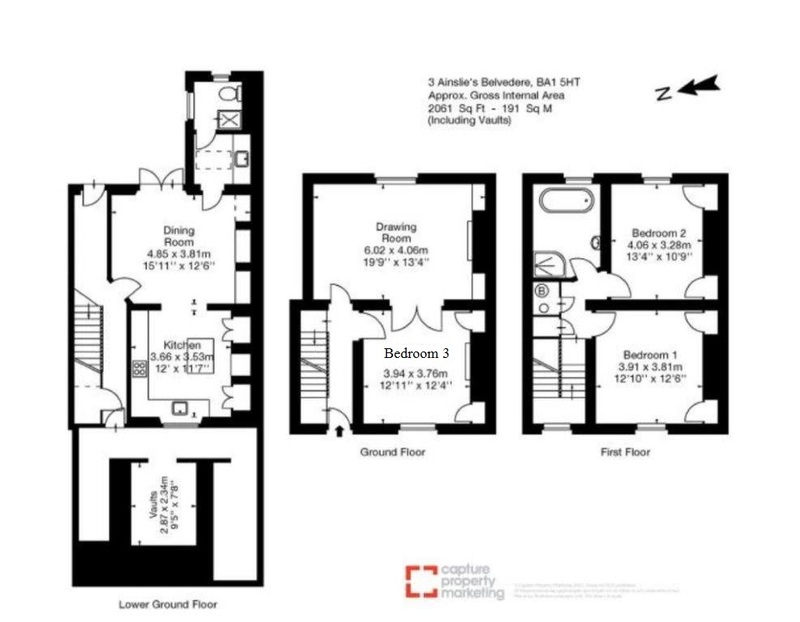 This could have been explained more clearly in the property details. Lovely stay and would return. Beautiful property. 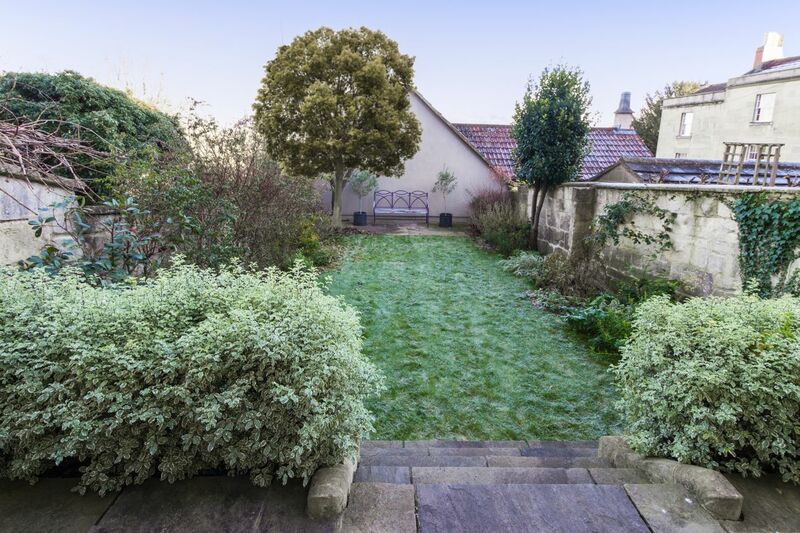 Very well appointed and located close to City centre. Beautiful abode The house has an elegant and welcoming atmosphere. All the amenities made our stay very comfortable. The view of the valley is stunning. We really enjoyed our stay in Ainslie's Belvedere, the house was lovely and catered for all our needs. The views from the house were stunning. The location was perfect, so close to everything. We had a wonderful holiday. Thank you to Sara for meeting us on our arrival at the house and showing us around. 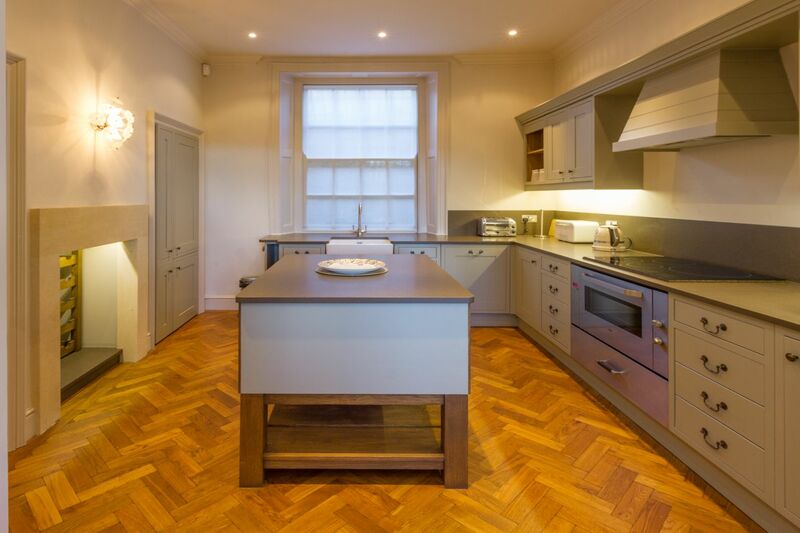 This was the first time we had used Bath Holiday Rentals, following a recommendation by a friend. Alexa was very efficient and helpful, advising which properties would be most suitable for our family and responding quickly to e-mails. 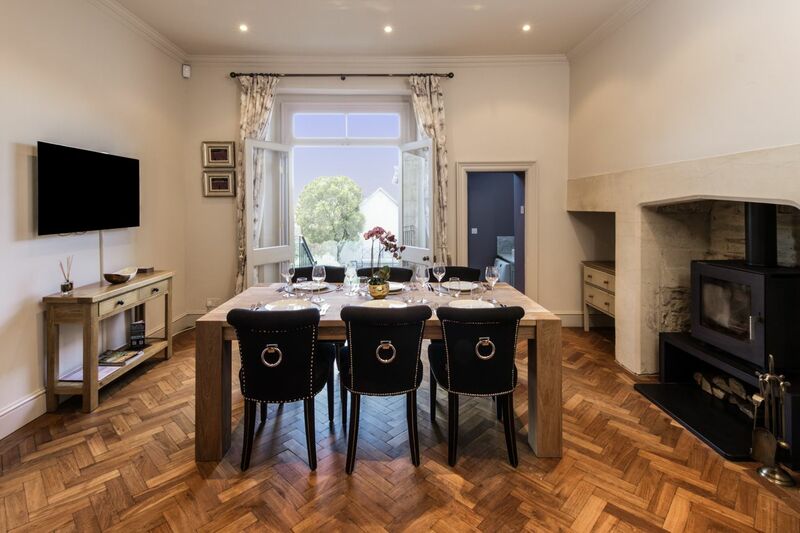 The property was finished to a high standard and when we arrived, one of the team met us to run through the parking permits and specific details of the property. 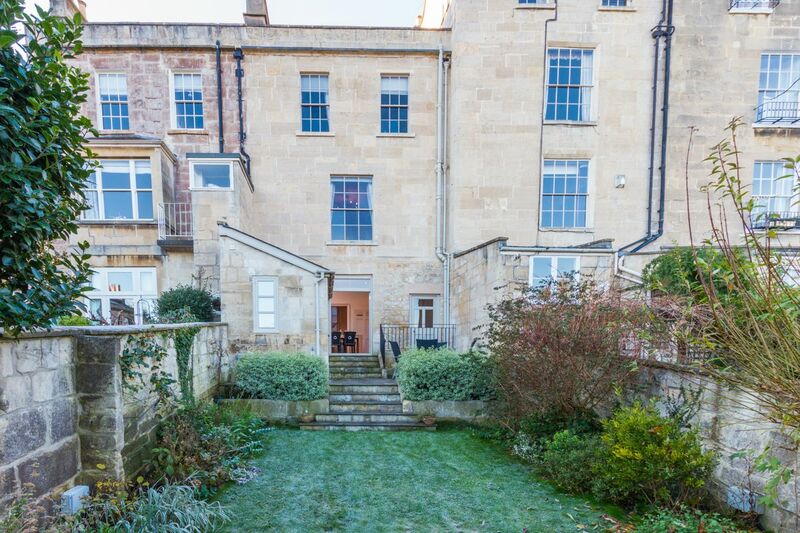 Will definitely use Bath Holiday Rentals again on our next visit to Bath. The house is truly fabulous and we plan to book it again next year! The finish and interior really is of the highest quality and I can't really think of anything to say in terms of constructive criticism. Perhaps a carpet runner on the top flight of stairs if children are to be welcome as the stone floor although beautiful is a little dangerous with younger children but otherwise it was absolutely superb. Oh and i couldn't find a city map but that may be me missing something. Thank you very much we will be back!